It's often said that everything is better with bacon -- and no where is that more true than at Baconfest Chicago. The big meaty mania festival is back Friday and Saturday at UIC Forum for three sessions. Do you have tickets? 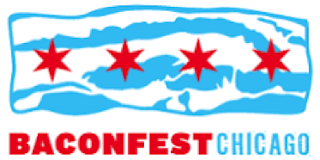 The 9th Annual Baconfest Chicago will be held on March 31 and April 1 at the UIC Forum. Chicago's premiere food festival will feature over 150 top chefs and world-renowned restaurants. It is a unique showcase for bacon talent from Food Network stars, Michelin honored chefs (Stars and Bib-Gourmands!) and James Beard nominees, side by side with beloved local chefs on the rise. Participating chefs in each session will also compete for the Golden Rasher Award, an award to celebrate special achievement in the bacon arts. A panel of judges will award for "Most Creative Use of Bacon" and "Best Front of House Presentation." A portion of proceeds from Baconfest Chicago are donated to The Greater Chicago Food Depository. Sponsor Jewel will bring unlimited bacon samples and and will give attendees coupons for free bacon. Tickets are still available at http://baconfestchicago.com/ticket/. Small Town Brewery will sample the following: Not Your Mom's Hard Iced Tea, Strawberry Rhubarb Beer and Apple Pie beer. Cicero Beverage Company will team up with Bakon Vodka to offer a Build-Your-Own Bloody Mary bar featuring a bacon-infused mix, horseradish accented mix, Bakon vodka, and an array of garnishes. Metric Coffee booth will be pouring their nitro-cold-brew coffee called Hellion. Pure Leaf tea will be brewing up samples for guests to try and Bai will be passing out refreshing antioxidant infusions. Partner Tahoe Kitchen Co will feature artisan olive oils and kitchen implements. Baconfest Chicago holds its ninth tasting event on March 31 and April 1, 2017 at the UIC Forum (725 West Roosevelt). Ticketholders gain access to a bacon-wonderland where the city's best chefs hand out amazing creative bacon snacks. Luxury brands, artisan bacon-makers, and bacontrepreneurs display, sample, and sell a multitude of bacon products. The best mixologists and brewers hand out bacon-inspired cocktails, beer and wine. To celebrate special achievement in the bacon arts, Baconfest gives out Golden Rasher Awards (the Oscars of the bacon world). Best of all, Baconfest is good for America. In addition to hosting a food drive and raffle at the event, Baconfest Chicago donates a portion of proceeds from ticket sales to the Greater Chicago Food Depository. Since 2009, Baconfest's support has resulted in more than $360,000 for Chicago's food bank, which translates into more than 1,100,000 meals for hungry people in the area.